So much great education out there and much of it is delivered by our SLTS sponsors. 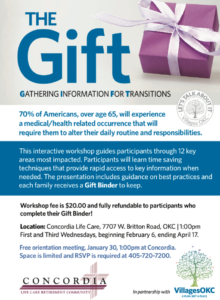 Join Concordia Life Care Community and Villages OKC on January 30th and learn about GIFT – Gathering information for transitions. You may even want to sign up for the workshop to complete your own GIFT binder. Call 720-7200 to reserve your seat.